This book tells the story of a pet capybara named Capyboppy that was kept by the Peet family during the 1960s. 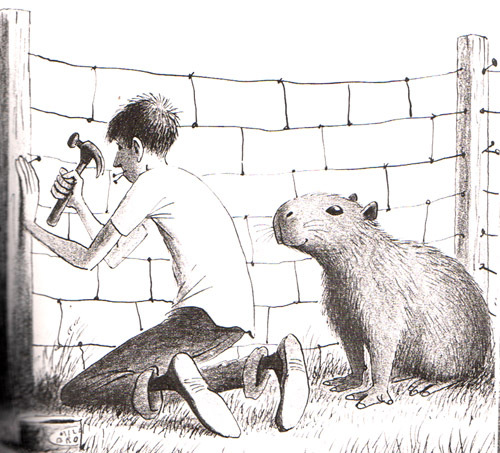 The story starts with teenage Bill Jr. getting a juvenile capybara to keep as a pet. Capyboppy makes himself right at home, scaring the cats, chewing on things, sleeping on the couch with Margaret Peet and swimming in the pool with Bill Jr. and his friends. Things start to go bad when the Peets build an pen for Capyboppy out in the yard and Bill Jr. leaves for a long vacation in Mexico. The depressed capybara attacks a local kid who has come into his enclosure to feed him grass. Tommy Peet kicks Capyboppy as hard as he can, sending him to the bottom of the pool. Eventually Capyboppy recovers from injuries sustained by the kick but the Peets determine that he is no longer a suitable pet. They end up donating him to the LA Zoo where he is put in the hippo enclosure. The book ends with Capyboppy happily eating all the hippos’ food. The drawings in this book are amazing. Bill Peet managed to capture ever nuance of expression that I see in Caplin’s face every day. In many ways, Caplin acts just like Capyboppy and in other ways not. For instance, Caplin loves his innertube that we got him largely because of this book. On the other hand, Caplin never chews on anything except your occasional cord. Both Caplin and Capyboppy like to sit on the couch but Caplin would never roll over the way Capyboppy is portrayed. The lesson of the story appears to be that exotic animals don’t really make good pets. This is probably true for most people. The Peets don’t give much thought to the requirements of caring for a large, needy animal like a capybara before they get Capyboppy. They also don’t seem to take their responsibility for the animal as seriously as they should. And after Tommy kicks Capyboppy into the pool to protect the young neighbor, he spends two days doing nothing and yet the Peets do not take him to the vet or seek any veterinary help for him. That seems very irresponsible. Even with the drawbacks mentioned, I think this is an excellent book. The drawings provide a wonderful insight into capybara behavior. It’s hard to be objective about this book. 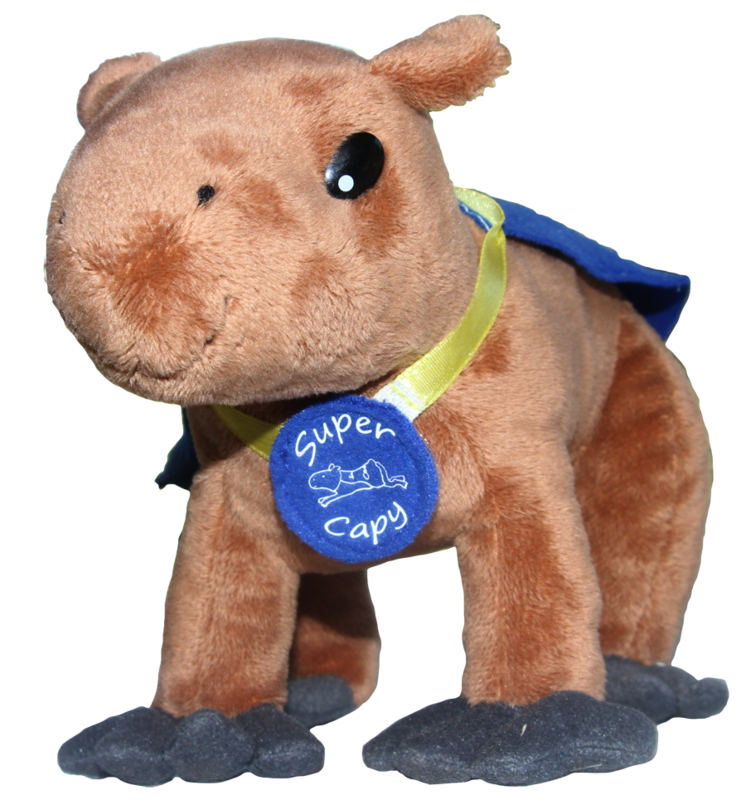 Capyboppy is my hero and the world’s most famous capybara (although I sometimes claim to have surpassed him). The artwork in the book should be in the Louvre or some similarly prestigious art museum where it can be appreciated by all and preserved for eternity. Not only is Capyboppy my hero, he is my role model. Every pose I strike is an attempt to copy his elegant style, the sublime cuteness of his expression. But the tragedy at the end is almost too much to endure. Sure Capyboppy looks happy in the drawing of him at the zoo but how could he be? I could never be happy if I had to go live with hippos instead of with my owner. My little heart would be broken forever.